In previous posts we have looked at the fish of the Sea of Galilee, ports of the Sea of Galilee, and Tabgha (Heptapegon) which has been called the fishermen’s suburb of Capernaum. In this post we will concentrate on how the fishing was done. Some fishing was done by casting a hook into the sea (Matthew 17:27). 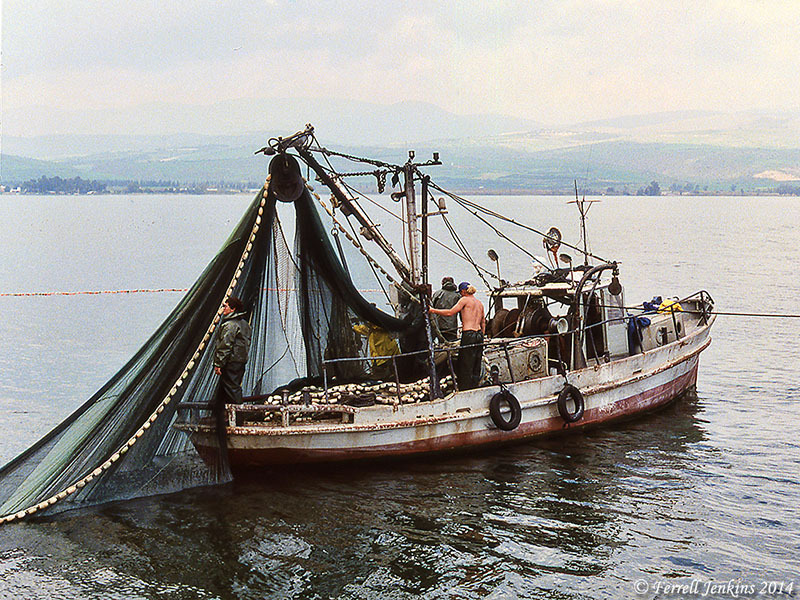 The cast-net could be thrown by an individual fisherman (Matthew 4:18). The seine or dragnet required several workers (Matthew 13:47). The trammel net involved tying together several nets (Mark 1:19-20). The Hook. I suppose fish hooks are common enough not to need a photo but I will include them in this photo made in the Eretz Israel Museum, Tel Aviv. it shows a cast-net and some fishing hooks in the lower right corner. Note the lead weights on the bottom of the net. Lead weights such as these have been found at various archaeological excavations. Cast-Net and fish hooks. Eretz Israel Museum. Photo by Ferrell Jenkins. The Cast-Net. 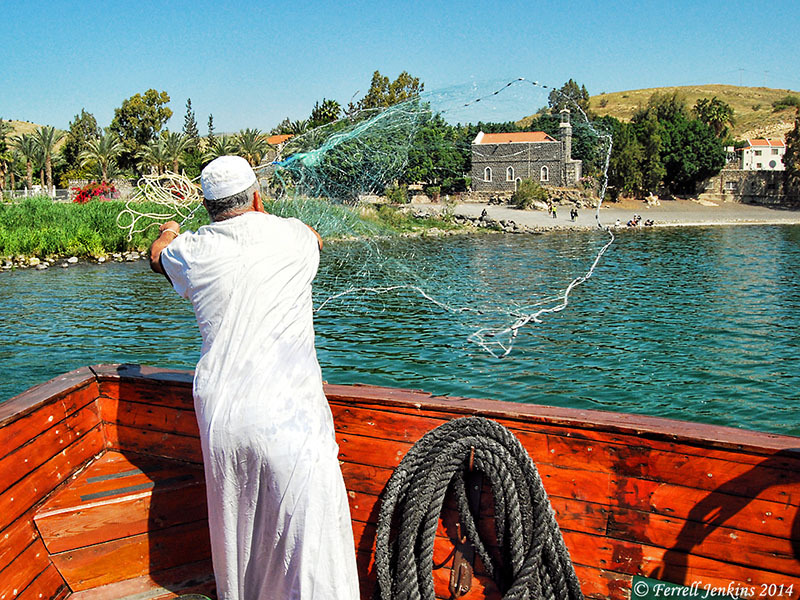 This photo shows a fisherman casting a net in the warm, shallow water near Tabgha. The cast-net can be thrown from the edge of the water or from a boat. Fisherman casting a net in the warm water at Tabgha. Photo by Ferrell Jenkins. The Seine or Dragnet. In the parable of the net in Matthew 13:47-50, the Greek word for net is sagene. I note that the NAU and the NKJ use the term dragnet, while other versions use the generic net. This is clearly the seine which gathers all kinds of fish that must then be sorted by the fishermen. I understand about the seine. As a youngster I visited an uncle and aunt who lived near New Hope, Alabama. My uncle set a seine on the Flint River. 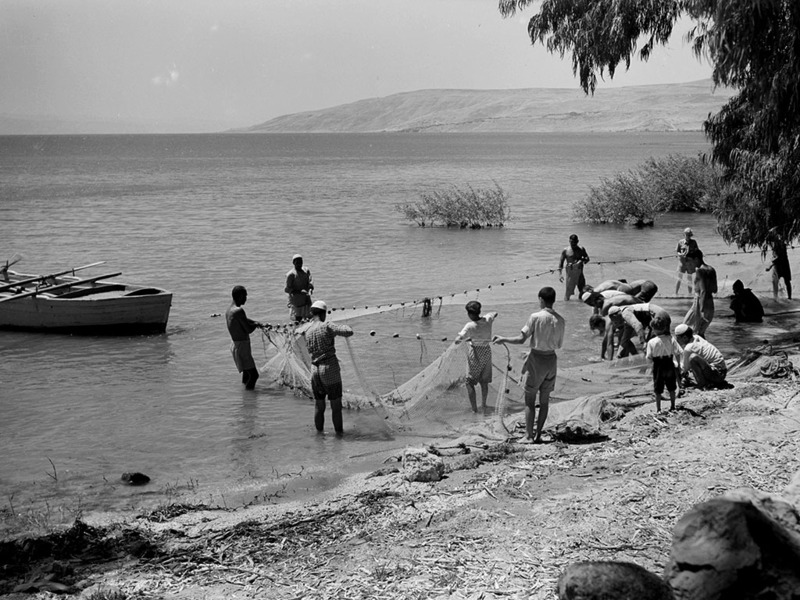 In the morning he would say, “Let’s go down to the river and see if we have caught anything.” But, I have not seen the seine in use on the Sea of Galilee except in older photos. Here is a photo from the American Colony and Eric Matson collection available from Life in the Holy Land. Fishermen bringing in a seine (or dragnet). Photo: Life in the Holy Land. The next photo is one that I have enhanced from the Eric Matson collection at the Library of Congress. Fishermen using a seine. Photo: Eric Matson Collection, LOC. A modern adaptation of the seine or dragnet is seen in modern times. I learned that it is called the Purse Seine. The first photo, scanned from a 1992 slide, shows the seine is heavy with the catch of the night. 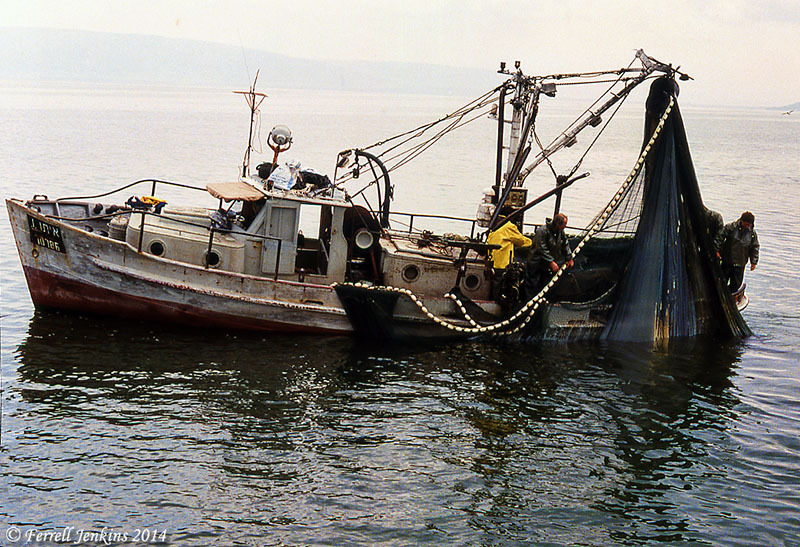 Fishing boat getting ready to unload a purse seine. Photo by Ferrell Jenkins. The next photo shows the fishermen getting ready to unload the catch. The Trammel Net. Nun says that the net being used by the early disciples of Jesus is the trammel net (Mark 1:19-20). 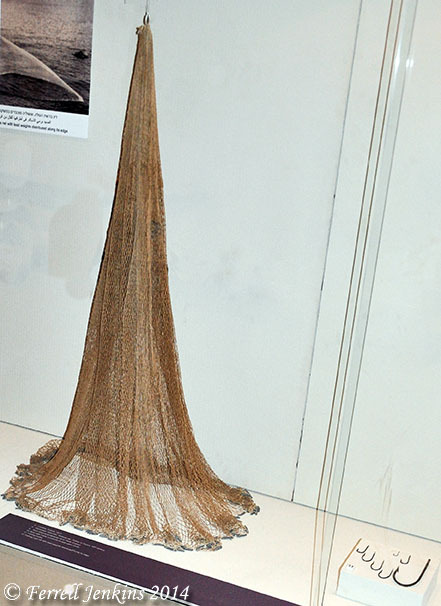 This type of net was made by tying together several cast-nets. You can locate many photo illustrations by searching for “trammel nets” in Google. 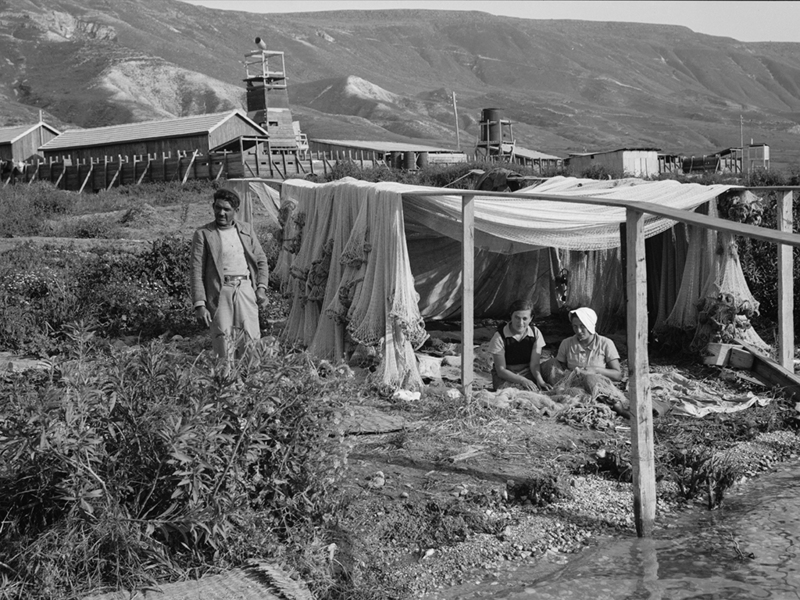 Here is another photo from the Matson collection showing the mending of nets at Ain Geb (En Gev). Girls of Ain Geb, a Jewish settlement on the east side of the Sea of Galilee. Girls of the settlement mending fishing nets. Photo: Eric Matson collection LOC. 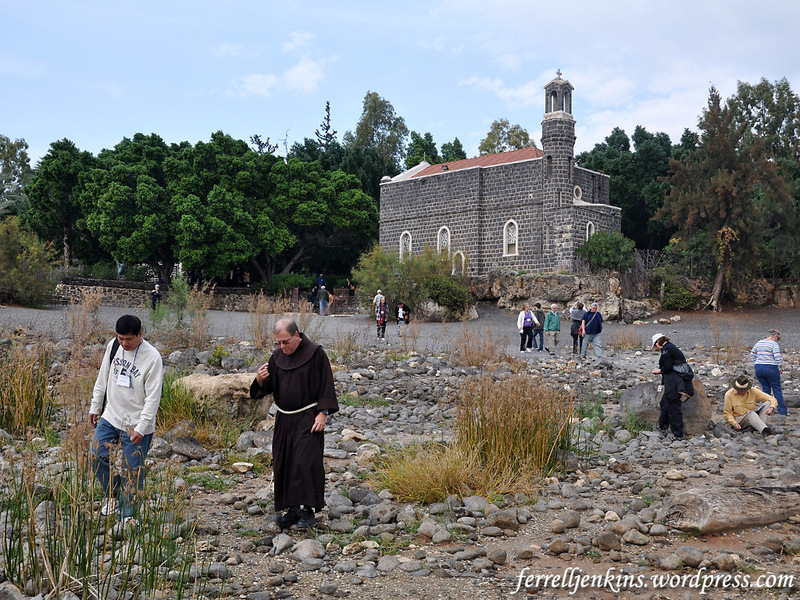 Mendel Nun describes Tabgha as “The Fishermen’s Suburb of Capernaum.” Tabgha is a corrupted form of the name Heptapegon which means “seven springs.” Why would someone who lived at Capernaum, like Simon Peter and Andrew (Matthew 4:13-20), think of going west 1½ miles to fish? Nun explains the importance of Tabgha for fishing. 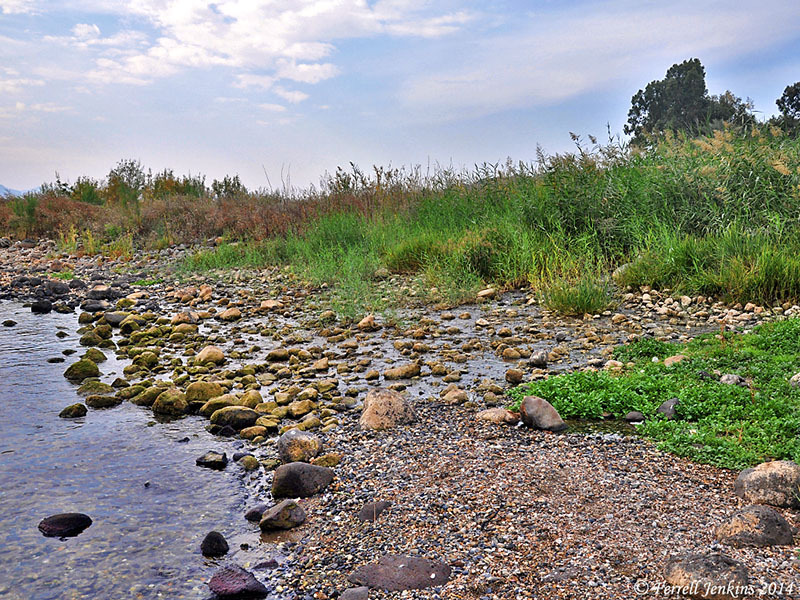 The springs of Tabgha have great economic importance. In the winter, the warm water draws schools of warmth-loving musht, tropical in origin, to the vicinity. The waters of the springs were once used to operate several flour mills. The Capernaum fishermen stayed in this area during winter and early spring, making Tabgha an important industrial suburb of Capernaum. A small harbour which served the millers and fishermen was found in the nineteen seventies. 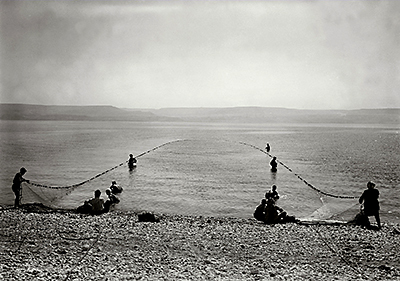 (The Sea of Galilee and Its Fishermen in the New Testament, 14). Just a few yards west of the Church of the Primacy, which we showed in the previous post, one of the seven warm springs was flowing freely during our 1992 visit to the site. When the water is high one would not notice this spring. One of the seven springs at Heptapegon (Tabgha). Photo by Ferrell Jenkins. We are not told where Peter and Andrew were fishing when Jesus called them, but Tabgha certainly would be a good place. And this would be a good place for the events of John 21, or the earlier account recorded in Luke 5:1-11. Rousseau and Arav (Jesus and His World, 97) conflate these two accounts into one and conclude that John “was written by a different author or editor.” A reading of both texts shows that the one in Luke is at the beginning of the ministry of Jesus when He calls the disciples, and the one is John is at the close of His earthly ministry after His resurrection (21:14). It would be common for fishermen to stand on the shore or in the edge of the water and cast a net into the warm water where the fish gathered. 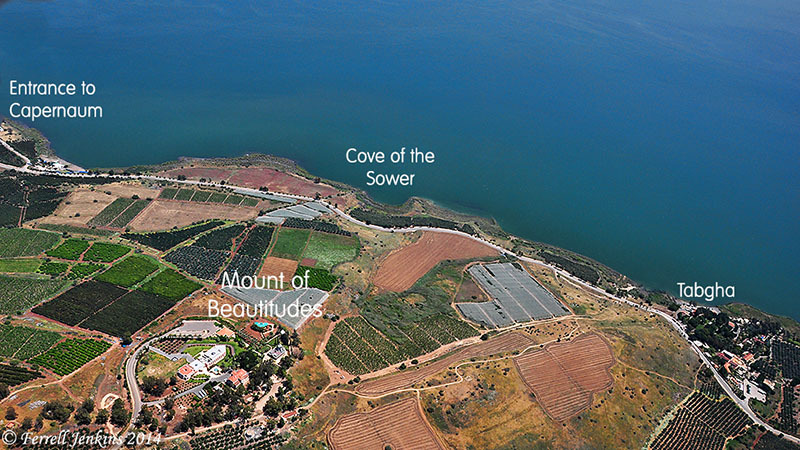 Our final photo this time is an aerial view showing the north shore of the Sea of Galilee from Tabgha on the right (west) to the entrance to Capernaum on the left (east). The traditional Mount of Beatitudes is on the hill above. The distance from the entry to Capernaum to Tabgha is 1.25 mile on a straight line. Add another .4 mile to reach the archaeological site of Capernaum. North shore of the Sea of Galilee from Capernaum to Tabgha. Photo by Ferrell Jenkins. Mendel Nun contrasts the knowledge of 19th century explorers with what has become known as a result of his work. Early 19th-century explorers, searching for places where Jesus had walked, attempted to locate the ancient harbors of the Sea of Galilee but failed. Now, after 25 years of searching and researching, we have found them. We have recovered the piers, promenades and breakwaters of the ports. We have also uncovered the ships’ anchors, the mooring stones the sailors tied their ships to, and even the weights fishermen once fastened to their nets. We always knew the harbors must be there, but we had no idea we would find so many remains. (“Ports of Galilee.” BAR 25:04, July/Aug 1999. In the 1999 article Nun says that we now have only four small ports serving the motorboats, ferries, and fishing boats, but in ancient times there were no less than 16 bustling ports. When the harbors and anchorages were originally built the water level was about 695 feet below sea level. 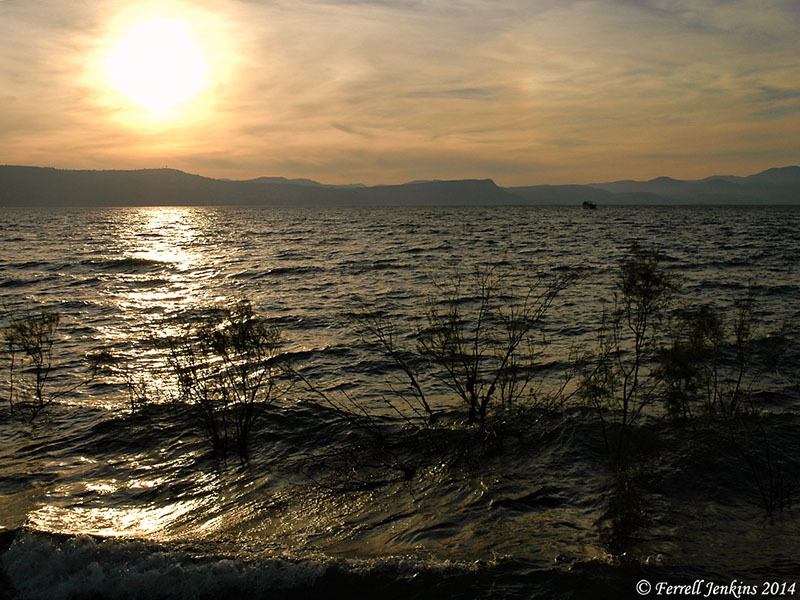 As a result of natural changes about a thousand years ago, the water level gradually rose about 3 feet, but the water level this week is 698 feet below sea level (Kinneret Bot, Dec. 2, 2014). The first ancient port discovered by Nun was the port of Kursi on the eastern side of the lake in 1970. Murphy-O’Connor gives this explanation about the heart-shaped stones. Hopefully this illustration will allow us to see how the harbors that had become lost in time have become known in the past few years. 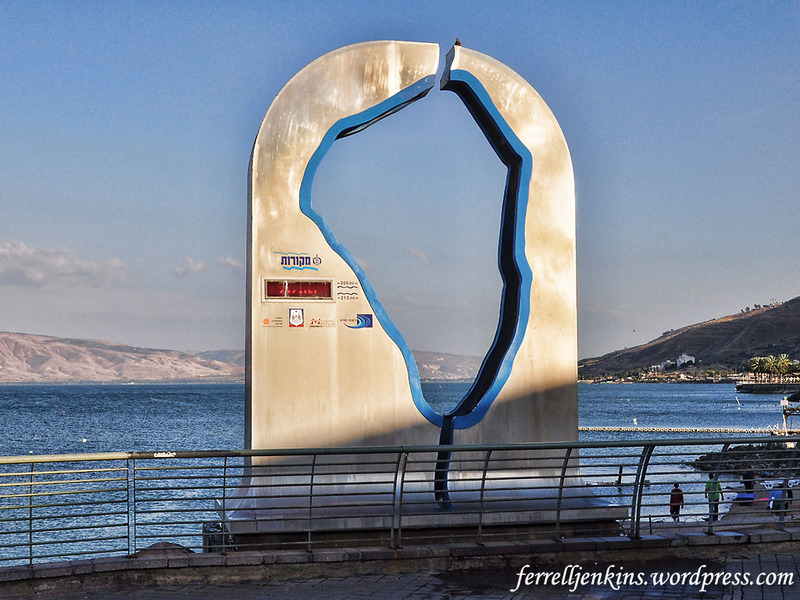 Our photo today was made from NW of the Sea of Galilee. The formation on the right is known as Mount Arbel. The agricultural area you see slopes down to the Plain of Gennesaret which stretches about 2½ miles to the Sea (Matthew 14:34). View of Mount Arbel and the Sea of Galilee from the NW. Photo by Ferrell Jenkins. 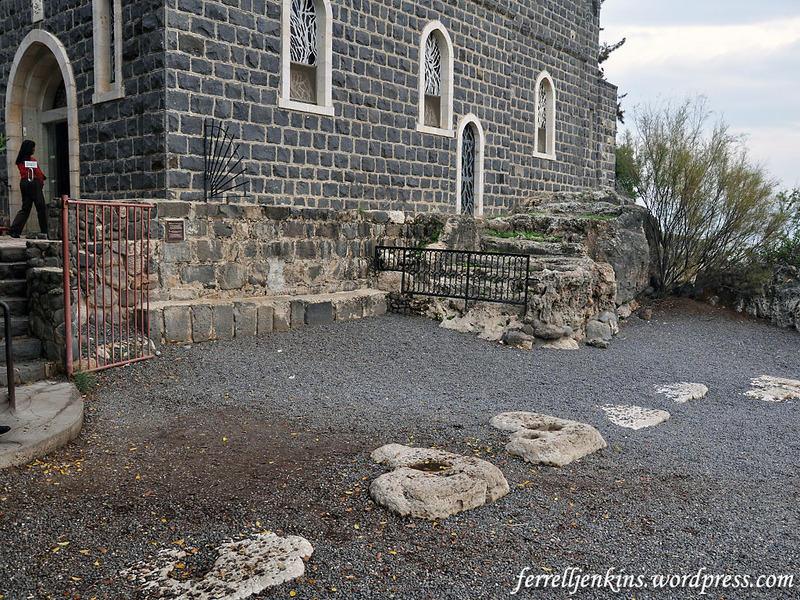 Across the Sea of Galilee is a portion of the Golan Heights, known in Old Testament times as Bashan. This territory was taken by Israel from Og the king of Bashan and eventually became territory belonging to the tribe of Manasseh. A city within the territory of Bashan was named Golan, and became one of the Israelite Cities of Refuge (Joshua 20:8). Mount Arbel has its own history outside the Biblical text, but I will save that for another time. 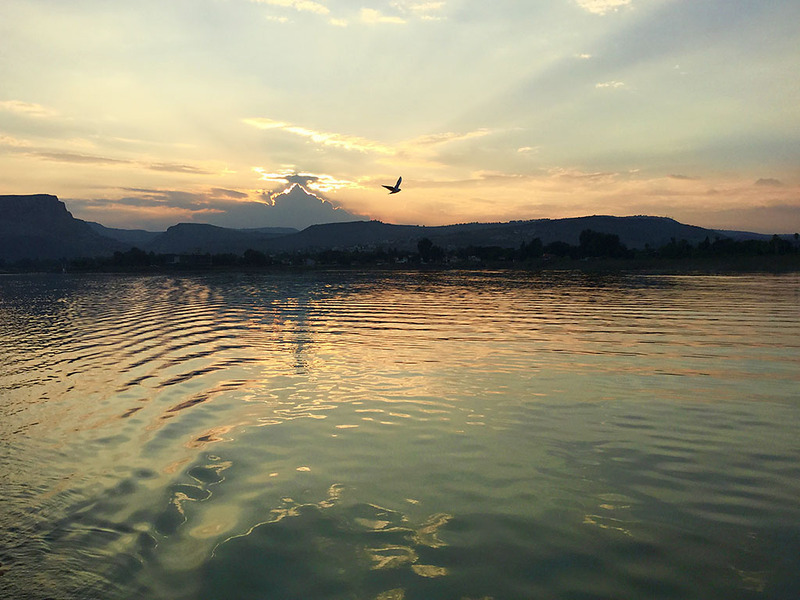 In response to our recent post on Sunset from En Gev on the Sea of Galilee here, Randy Myers tried to post an image of a photo he made of a sunset on the Sea of Galilee about two weeks ago. I contacted Randy and asked permission to post his photo on the blog. 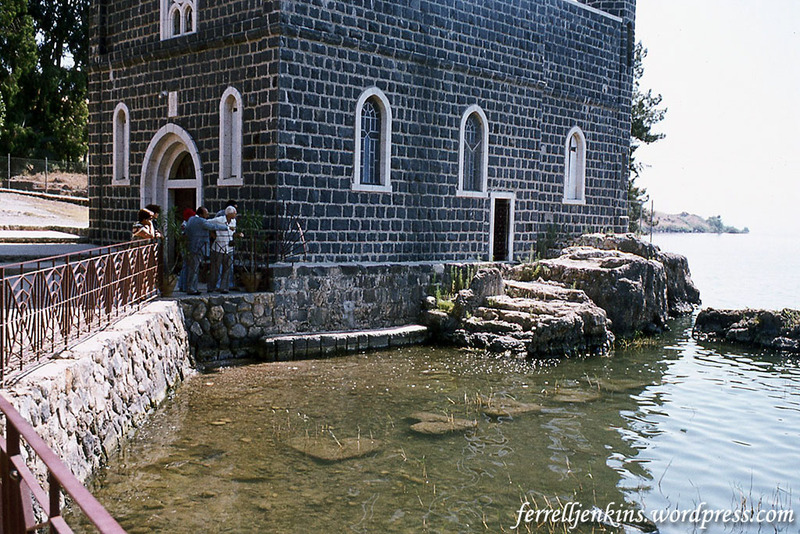 It is a beautiful photo with Tiberias in the shadows. The bird in flight adds a really nice touch. Sunset on the Sea of Galilee. Photo by Randy Myers. Much of the activity of Jesus during His earthly ministry involved the Sea of Galilee and the various ports on its shore. Here is one example. After Jesus healed a man with a withered hand on the Sabbath, the Pharisees and the Herodians made a plan to destroy Him. Randy, thanks for sharing this photo with us. Travelers to the Sea of Galilee are always delighted to get a sunrise photo from Tiberias. If you travel around the lake to the eastern shore in the late afternoon you might see two things. Because the winds from the Mediterranean come from the north east you might see the stormy waves on the sea. And you might see a beautiful sunset. The photo below is made from Kibbutz En Gev. 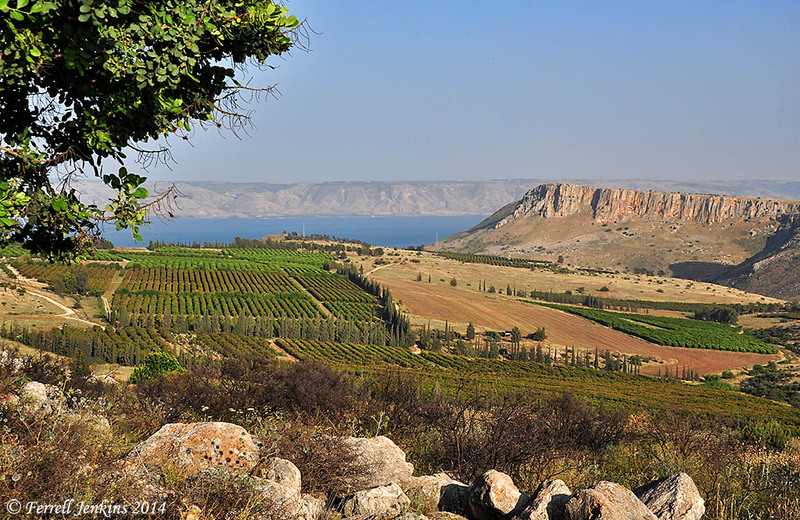 The small village, home to some of the fishing and touring boats that ply the Sea of Galilee, is located in the shadow of the impressive mound of Hippos (Susita). Sunset from En Gev. Photo by Ferrell Jenkins. The harbor of Hippos (Susita) is located immediately south of En Gev. It is one of 15 or more ancient harbors now known to have existed in the time of Jesus.